A rule largely aimed at opening trade in telecommunication services will require Russia and other international providers of GNSS services to apply for authorization before their navigation signals can be legally used in the United States, a Federal Communications Commission (FCC) official has told GPS experts on the Space-based Positioning, Navigation, and Timing (PNT) Advisory Board. The provision will also require manufacturers to get multi-constellation receivers certified for U.S. use, said Ronald Repasi, deputy chief of the FCC’s Office of Engineering and Technology. “If we seek comment on a proposed use of the satellite band, it could be a foreign system right?” Repasi told the board at a December 10 meeting. “We would put that up for public comment and the public has the opportunity to object to us, agree to issuing that authorization or supporting it or finding other some issues that may be important from their perspective like power levels and out of band emission levels and such." Repasi suggested that the Adjacent Band Compatibility (ABC) Assessment now under way by the Department of Transportation Research and Innovative Technology Administration should look at the possibility of co-locating GPS receivers with high-powered MSS receivers and see if those would be compatible uses. The rule, which is implemented and enforced by the FCC, has its roots in the World Trade Organization Telecom Agreement of the late 1990s. It has only recently become an issue for the satellite navigation community as non-GPS GNSS constellations — known as radio navigation satellite systems (RNSS) in the world of radio spectrum regulation — have come into service. 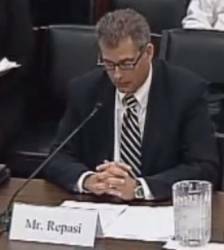 “Section 301 (of the Communications Act of 1984) basically says you need a license from the FCC if you are going to transmit any energy intentionally from some radio transmitter in radio frequency spectrum,” Repasi told the National Space-Based Positioning, Navigation, and Timing (PNT) Advisory Board December 10 in Washington, D.C. The issue is not new, he noted. The FCC issued a public notice March 15, 2011, detailing the criteria for securing a waiver, if recommended by the National Telecommunications and Information Administration (NTIA), acting on behalf of the administration. Conditions on which the NTIA would recommend such a waiver include: 1) granting the waiver is in the public interest, 2) the waiver is consistent with trade and treaty obligations, 3) the applicant complies with United Nations space debris mitigation guidelines, and 4) the waiver request is limited to receive-only radio navigation services. Brad Parkinson, the acting chair of the PNT Advisory Board expressed concern about the international ramifications of the filing rule. A source familiar with the issue told Inside GNSS the United States is not currently required by any country to file for authorization for the GPS signals to be received. Concern has arisen, however, that that might change, particularly if U.S. agencies implemented adverse rulings on other nations’ GNSS systems. The issue is not with establishing an application process, the expert added, but if that process is used to create a competitive advantage. The near-term consequences for those in the United States, however, appear to fall more in the realm of what cannot be done. An unauthorized signal may not, for example, be protected from interference. Failing to have a signal authorized, said Repasi, meant that that signal cannot be used by services like E911 even though having a device capable of using a foreign signal was not illegal. “It comes down to what we expect to happen in the public comment process when we get a request to operate with those foreign systems,” said Repasi. That process could begin soon. A source, who asked not to be named in order to be able to speak freely, said the Europeans have already applied for U.S. authorization for Galileo signals, although the application has not yet been posted for public comment. While the full implications of the rule were unclear, they were deemed potentially serious by the board, decided to flag the issue for the National PNT Executive Committee, the most senior of the nation’s management groups for PNT.